Larry calles me at work around 5:30 and says " Can you hear that?" THAT turns out to be a major HAIL storm passing over our house. When I arrive home, I see devestation everywhere - it looks like a tornadoe has hit our neighborhood. 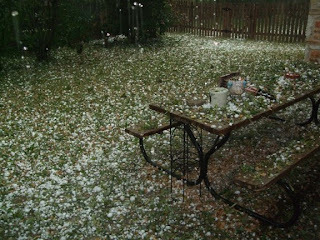 Hail is everywhere, and tree debris litters the ground. 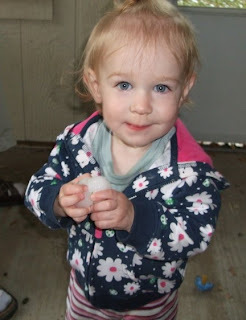 So, we let baby hold one of the hail balls. It is bigger than a golf ball. She hold the cold ice and licks the ice ball and laughs. Baby's first hailstorm. 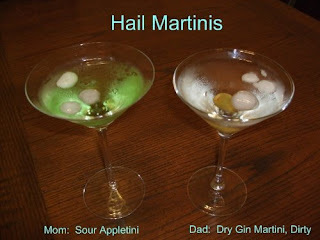 After Alice went to bed - Mom and Dad made hail storm martini's to cap off the day. Exciting! and the lawn got watered! BONUS!